It’s actually quite a simple idea, using a series of black dots and blobs to outline a negative space (red in this example), giving that space the “crackling” look of raw energy. Of course, you need to have talent to get the effect right. I wanted to figure out if there was a way to achieve this effect semi-automatically, using software. I’m no artist, and I can’t draw for real, but I’m interested in creating this stuff, so I gave it a go using The GIMP. The GIMP (Gnu Image Manipulation Program) is an excellent open-source graphics package, which can do a lot of what Photoshop can do, but for free. There’s a big community of users who create filters, plugins and scripts to extend its capabilities, and I’ve used it for many things over the years. After playing around with the settings and brushes available, I’ve managed to achieve something that looks pretty good without having to code a plugin or write a script. 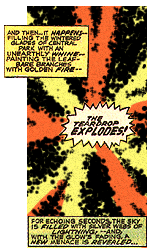 As an example, I took the famous panel from Daredevil (#77) which gave the band The Teardrop Explodes their name. It’s a striking image as it is, but could it be improved with some Kirby Krackles? After all, it was a Marvel comic. I removed the background, leaving behind the text panels and the main starburst in the center. Then I used the GIMP paintbrush (shortcut ‘P’) with the following settings to give us the black Kirby Krackles dots. I used the Paintbrush in Normal mode, full opacity, with a 5px size. 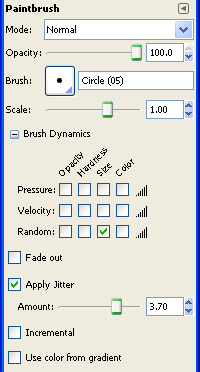 The key parts that give us the effect we want are the Brush Dynamic for Size set to Random, and Jitter applied, with a setting of about 3.7. You can play with the Jitter and Brush Size settings to get exactly the effect you want. In a new layer over the original art, I applied the paintbrush in the darker areas (to outline the “negative space”). I then used the colors from the original art to give the negative space the correct shading. I also applied a little HSV noise to the background colors to make it look like the old printed page. Not bad eh? The original was a bit small, so the dots had to be small too, and that made them a bit pixellated. It’s not perfect, but I’m pretty pleased with it, and it’s a good example of what you can do with GIMP and some fiddling with settings! 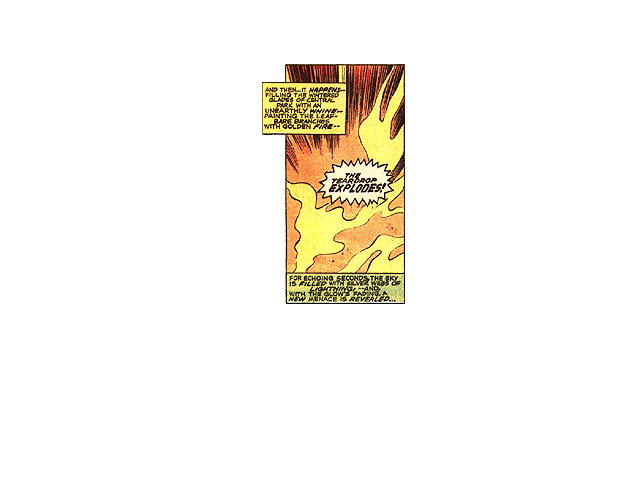 This entry was posted in "Misc" and tagged Comics on 2011-04-05 by mjp. About time too. Still need to get round to writing about it, but here are the photos. This entry was posted in "Misc" and tagged Comics, Photos, San Diego, Toys on 2008-09-12 by mjp.